1.5 Dci 110 Brun Prestige 6 / 110 Break CTTE 5 2012 Dci 155949 8.000 Euros T.C. 2.5 TD Bleu Anniversaire 9 / 115 BReak CTTE 5 2001 did 139570 8.000 Euros T.C. 1.7 Inj Vert 7 / 81 Break VP 4 2011 ESS 35000 9.800 Euros T.C. 2.5 TD Gris Classic 10 / 100 Break VP 5 2001 TDi 113200 10.000 Euros T.C. 1.5 Dci 110 Bleu Prestige 6 / 110 Break VP 5 2010 Dci 59500 10.500 Euros T.C. 1.6 Dig-t 190 Noir Urban 11 / 190 Break VP 5 2012 ESS 68000 10.700 Euros T.C. 2.5 Tdi 4 Portes Bleu Gris Intense 10 / 115 Pick Up CTTE 5 2004 TDi 159949 11.000 Euros T.C. 1.6 vvti 3 Portes Gris foncé standard 7 / 106 Break VP 4 2007 ESS 69500 11.400 Euros T.C. 2.2 Dci 5 Portes Gris 8 / 136 Break VP 5 2006 Dci 56500 11.900 Euros T.C. 1.6 Vvti 3 Portes Gris Luxe 7 / 106 Break VP 4 2007 ESS 71800 12.000 Euros T.C. 1.9 ddis 5 Portes Gris Luxe 8 / 130 Break VP 5 2007 DDis 68000 12.400 Euros T.C. 2.5 dci Gris Elegance 8 / 170 Pick Up CTTE 5 2009 Dci 198000 12.800 Euros T.C. 90 TD Vert Hard top 8 / 90 Fourgon. VP 3 1986 TD5 152476 13.500 Euros T.C. 1.6 VVti 120 4x2 Blanc Avantage 6 / 120 Break VP 5 2017 VVTi 22300 13.900 Euros T.C. 2.4 VVti 3 Portes Noir BVA 12 / 166 Break VP 4 2010 ESS 44000 13.900 Euros T.C. 2.5 TDci Brun XLT Pack 10 / 143 Pick Up . 5 2008 TDci 139000 14.000 Euros T.C. 1.9 Ddis 3 Portes BLanc Luxe 8 / 129 Break VP 5 2011 DDis 32500 14.000 Euros T.C. 1.7 CRDi Noir Premium 6 / 115 Break VP 5 2014 CRDi 65172 14.700 Euros T.C. 3.2 did 5 portes Gris Dakar BVA 12 / 163 Break VP 7 2005 Did 132000 14.900 Euros T.C. 3.2 Did 3 Portes Gris Dakar 11 / 163 Break VP 5 2005 Did 116000 14.900 Euros T.C. 2.5 Dci King Cab Bleu Elegance 8 / 174 Pick Up CTTE 4 2009 Dci 111622 14.900 Euros T.C. 0.9 Tce 90 cv Gris Cassioppé Intens 5 / 90 Break VP 5 2018 ess 5000 14.990 Euros T.C. 1.2 TCE 125 Gris Foncé Prestige 7 / 125 Break VP 5 2016 ESS 26783 15.000 Euros T.C. 2.5 did 4 Portes Intens Intense 10 / 136 Pick Up CTTE 5 2006 Did 115000 15.200 Euros T.C. 3.0 D4d 3 Portes Noir VXV BVA 11 / 163 Break VP 5 2003 D4d 141910 15.500 Euros T.C. 2.5 Did 4 Portes Noir Intense 10 / 136 Pick Up CTTE 5 2006 Did 112000 16.000 Euros T.C. XDrive 20 DA 4x4 Noir Confort Cuir 10 / 177 Break VP 5 2011 62900 16.500 Euros T.C. 2.5 Dci Noir El?gance 12 / 174 Break VP 7 2008 Dci 101000 16.500 Euros T.C. 2.4 Sport Brun métal 10 / 143 Bach VP 4 2005 ESS 100600 16.800 Euros T.C. 1.6 Dci 130 cv FWD Noir Acenta pack 7 / 130 Break VP 5 2014 Dci 49000 16.900 Euros T.C. 2.5 Dci 4 Portes Gris Elegance 8 / 174 Pick Up CTTE 5 2008 dCi 84500 17.000 Euros T.C. 2.5 did 4 Portes Anthracite X-Storm 10 / 178 Pick Up CTTE 5 2012 Did 127000 18.500 Euros T.C. 4.0 Vert Sahara 14 / 170 Bach VP 4 1998 ESS 88500 18.900 Euros T.C. 2.8 CRD Vert Sport BVA 12 / 177 Bach VP 5 2007 CRD 135000 19.500 Euros T.C. 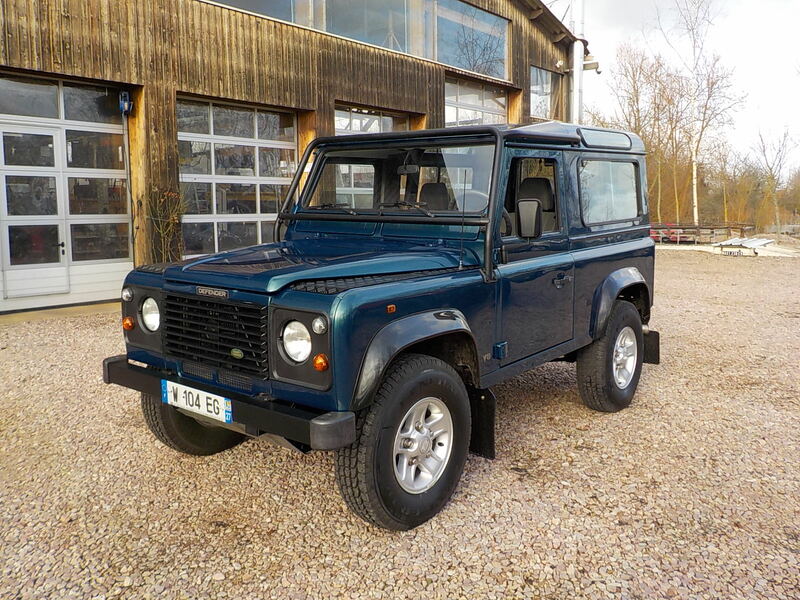 2.5 dci 4 portes Brun LE 8 / 190 Pick Up CTTE 5 2011 Dci 77500 19.800 Euros T.C. 2.8 CRD Noir Sport 12 / 177 Bach VP 5 2007 CRD 78000 21.500 Euros T.C. 3.2 Did 3 Portes Noir Instyle 12 / 170 Break VP 5 2008 Did 63800 22.500 Euros T.C. 5 cyl 3.2 TDci Orange Wildtrak 11 / 200 Pick Up CTTE 5 2016 TDci 137500 22.500 Euros T.C. 2.2 TDci 4 Portes Noir XLT 7 / 150 Pick Up CTTE 5 2014 TDci 44000 22.500 Euros T.C. 3.2 did 5 Portes Gris Instyle BVA 13 / 200 Break VP 7 2010 Did 74463 23.800 Euros T.C. 2.0 Tdci 150 4x4 Blanche Titanium BVA 8 / 150 Break VP 5 2017 Tdci 30000 23.800 Euros T.C. 3.2 Tdci 200 cv BVA Blanc Wildtrak 11 / 200 Pick Up CTTE 5 2017 TDci 27000 24.750 Euros H.T. V6 3.8 Noir Sport 14 / 200 Bach VP 5 2007 ESS 107000 25.500 Euros T.C. V6 3.8 BVA Noir Sahara 14 / 200 Bach VP 4 2008 ESS 81500 26.000 Euros T.C. V6 3.8 3 Portes Vert Sport 14 / 200 Bach VP 4 2010 ESS 54300 26.900 Euros T.C. V6 3.8 Gris Foncé Sport 14 / 200 Bach VP 5 2007 ESS 104000 26.900 Euros T.C. P1800 S Coupe Argent P18335 10 / 100 Coupe VP 4 1965 ESS 87234 27.000 Euros T.C. 2.2 TD4 Hard top Blanc S 7 / 122 Fourgon CTTE 2 2012 TD4 51590 28.500 Euros T.C. V6 3.8 200 cv Bleu Sport BVA 14 / 200 Bach VP 5 2008 ESS 78500 28.700 Euros T.C. V6 3800 Noir Sport 14 / 200 Bach VP 5 2007 ESS 88000 29.500 Euros T.C. 5 cyl 3.2 TDci Blanc Wildtrak 11 / 200 Pick Up CTTE 5 2018 TDci 10 30.400 Euros H.T. 3.2 Tdci 200 cv Noir Wildtrak 11 / 200 Pick Up CTTE 5 2019 TDci 10 30.800 Euros H.T. 3.2 Tdci Orange Wildtrak 11 / 200 Pick Up CTTE 5 2019 TDci 10 30.800 Euros H.T. 3.2 Tdci Gris foncé Wildtrak 11 / 200 Pick Up CTTE 5 2018 TDci 10 30.800 Euros H.T. 3.2 TDci Double Cab orange Wildtrak 11 / 200 Pick Up CTTE 5 2019 TDci 10 30.800 Euros H.T. 3.2 Tdci 200 cv Orange Wildtrak 11 / 200 Pick Up CTTE 5 2019 Tdci 10 31.900 Euros H.T. V6 3.6 Unlimited Rouge Sahara BVA 20 / 286 Bach VP 5 2011 ESS 98000 32.000 Euros T.C. 110 TD4 SW Blanc SE 7 / 122 Break CTTE 5 2009 Td4 65000 34.500 Euros T.C. 90 V8 4.0 Bleu 50 i?me anniversaire 15 / 184 Break VP 6 1999 ESS 126000 60.000 Euros T.C.